Cider is a beverage made from apple juice. Non-alcoholic and alcoholic varieties are produced. Alcoholic beverages from cider are made from the fermented juice of apples and are known in the U.S. and Canada as hard cider, while non-alcoholic versions are known as apple cider. Alcoholic cider varies in alcohol content from less than 3% ABV in French cidre doux to 8.5% ABV or more in traditional English ciders. Left: Cidre bouché from Normandy. Some of the best ciders are produced in France. French cidre is an alcoholic drink produced predominantly in Normandy and Brittany. It varies in strength from below 4% alcohol to considerably more. 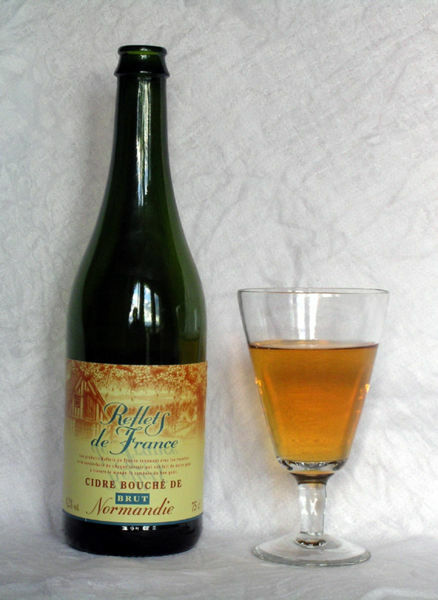 Cidre Doux is a sweet cider, usually up to 3% in strength. 'Demi-Sec' is 3–5% and Cidre Brut is a strong dry cider of 5% alcohol and above. Most French ciders are sparkling. Higher quality cider is sold in champagne-style bottles (cidre bouché). Many ciders are sold in corked bottles, but some screw-top bottles exist. Until the mid-20th century, cider was the second most-consumed drink in France (after wine) but an increase in the popularity of beer displaced cider's market share outside traditional cider-producing regions. In crêperies (pancakes restaurants) in Brittany, cider is generally served in traditional ceramic bowls (or wide cups) rather than glasses. A kir breton (or kir normand) is a cocktail apéritif made with cider and cassis, rather than white wine and cassis for the traditional kir. The Domfrontais, in the Orne (Basse-Normandie), is famous for its pear cider (poiré). The calvados du Domfrontais is made of cider and poiré. 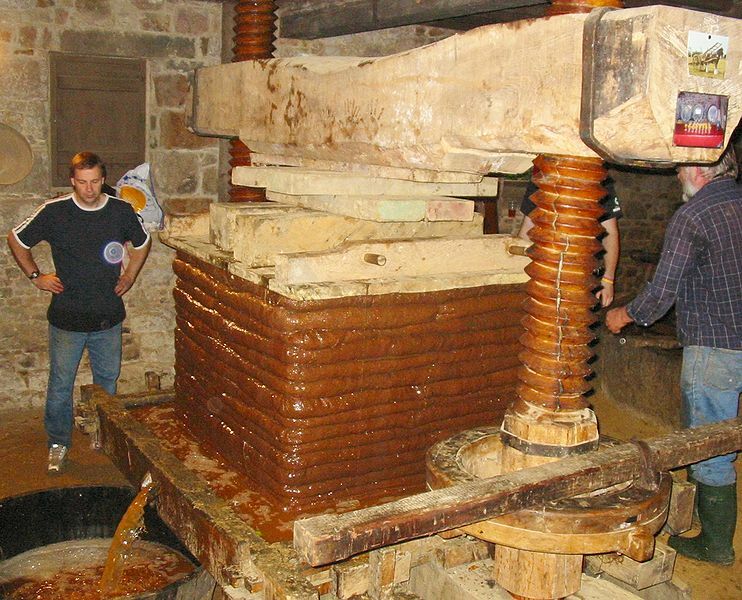 Left: Pressing apples for cider. Calvados, from Normandy, is a spirit made of cider through a process called double distillation. In the first pass, the result is a liquid containing 28%–30% alcohol. In a second pass, the amount of alcohol is augmented to about 40%.